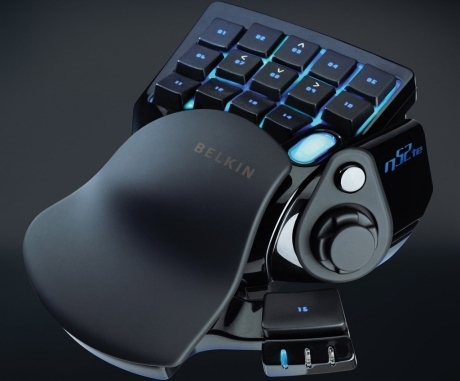 The global manufacturer of computer hardware, Belkin has announced a redesigned version of its popular Nostromo SpeedPad n52 one-handed PC controller, named as n52te SpeedPad. According to the company, it’s a upgraded model based on user feedback on its predecessor – n52. The latest n52te SpeedPad will feature some cool blue backlighting on the keypad and scroll wheel, providing the gaming device a rather wonderful look, especially at night. With a partnership with the professional gaming company – Razer, the new SpeedPad has included the Razer’s killer performance software which allows the gamers to robust customization tools and keep their settings organized in personal profiles. Besides, it will sport 15 fully programmable buttons along with a programmable 8-way thumb pad and a removable joystick, aiming to improve your “gaming speed”. The new Belkin n52te SpeedPad that designed to be adept at PC games including FPS (first-person shooter), MMORPG (massive multiplayer online role-playing games) and RTS (real-time strategy) will be available in coming November for around $70.